1. First up is a fairly unbiased breakdown of Measure S by Curbed. This article will explains who is involved, what kind of current developments would be affected, a basic breakdown of the measure, as well as arguments for and against. You will not get a very detailed picture here, but Curbed offers a great overview. 2. 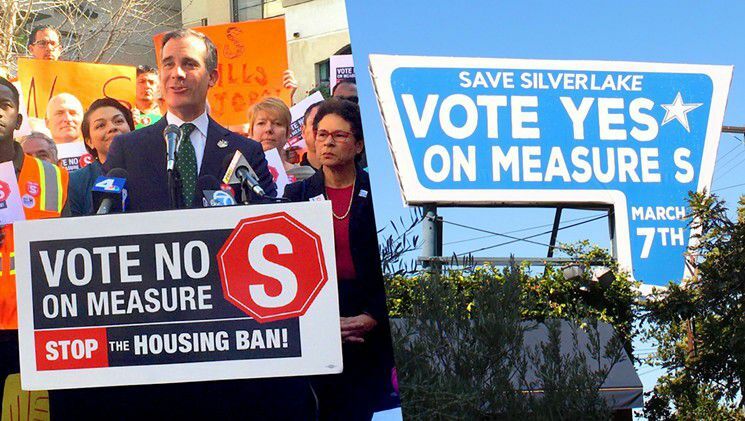 Now that you have the overview, if you want to get into the details than this article about Measure S on Ballotpedia offers an in depth look. Not only does it showcase a breakdown of what is in included in the measure, but it also looks at financial impact, more detailed arguments for and against, background information, and much more. 3. Next up is a large Q&A regarding Measure S on the LA Times. This article is a little more conversational but full disclosure: the LA Times are funding "No on S" so while this article is still informative, know that it does come from one specific side of the argument. Here is another article from the LA Times focused on the misinformation being spread around about Measure S.
4. While trying to stay as unbiased as possible, the fact that I could not find an article in favor of Measure S from a reputable news source is telling. However, for the sake of hearing what supporters have to say about the measure here is the Yes on S website. There are plenty more articles out there to further educate yourselves on Measure S. I highly recommend reading about them until you feel comfortable coming to your own conclusion. Don't forget to vote!